Jane Fielder�s work is varied in theme and tone, including for example depictions of the heads of autistic children, dreams, explosions, flowers and domestic scenes. In her presentations of urban landscapes, Victorian features moved forward to the present (as in Bradford and surrounding towns), a range of mood is likewise present. Her "Janescapes" register the disturbing grid-like format of nineteenth century town life � though years have passed history cannot be eradicated and the townscapes, though modified now, are still memorials to a dehumanising past reality, as presented, for example in Dickens� �Hard Times�. The ominous mood, for instance, of �No Public Access�, where below a queerly coloured sky washing flaps as if strung from former mill chimneys and windows are pitch black, no people move in the streets, suggests that even in the present things are not quite right, are humanly askance. The ominous note is reinforced by the wording kaill (kill) on a piece of industrial equipment in the foreground. In other pictures roads are grid-locked; in �Firm Control Bingley� behind a former mill chimney now labeled Damart � the plc replaces the mill as oppressor � grimly coloured clouds as in a chemical explosion feature. Worlds of oppression and disturbance mix with current scenes of urban reality. The birds sitting on the wire in �Yellow Bra Bingley� testify to a way of being beyond the jammed cars, developer�s equipment and black grids of houses; they may be omens, crows, or a chorus derisory of past and present, or simply neutral, outside the human world, nature (even in its preying aspect) creeping back in. 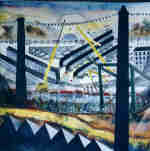 Part of this notion of something ominous interlaced with the ordinary is also present in her picture of surveillance modules located in open countryside for the use of U.S. and U.K. military and secret services � the sitting down and painting of the picture on location leading to the arrival of police vehicles and the artist herself quizzed as to the reasons for her presence and choice of subject. Others of Jane Fielder�s pictures deal with relationships between men and women as in �Lovers on Ducks� or �Cooling Tower Lovers� . In the former the idea of pursuit is prominent as the lovers ride past dream shapes, eerily rooted trees and unfamiliar objects. The cooling towers become colourful, even floral, as the lovers chase round them or dance. The need for ugliness to be subverted is a theme. Jane Fielder has lived in various locations in England, ranging from Kent to Gloucestershire and to Yorkshire, as well as in Ireland. 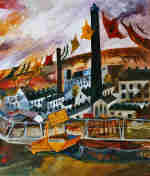 She has studied art in Bradford, Dublin and Farnham. Her varied experiences as a teacher of disturbed children, the elderly, injured people, as well as those of a mother and wife, her specific sense of a locations latent meanings and notions of subversive perception all contribute to her artistic expression.